Are you cabling optical fiber for the NBN under driveways, footpaths, small road crossing, expensive landscapes but don't want to spend the time and the money to reinstate what will be broken? 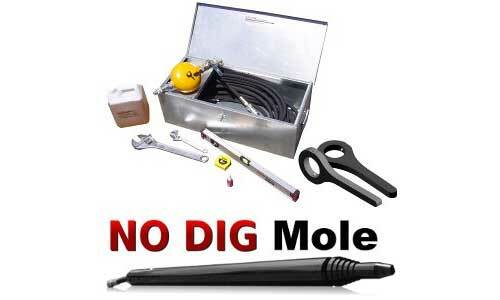 Go under it with a Soil Displacement Hammer NODIG Mole. FREE shipping in Australia on all packages. Checkout the NODIG Mole GOLD Package. The NODIG Mole Silver Package. The NODIG Mole single tool. Piston VS Screw compressor : See why screw is always better here.